Fairmont Hotel - it's a she! Luxury travel blog » Places » North America » Canada » British Columbia » Fairmont Hotel – it’s a she! 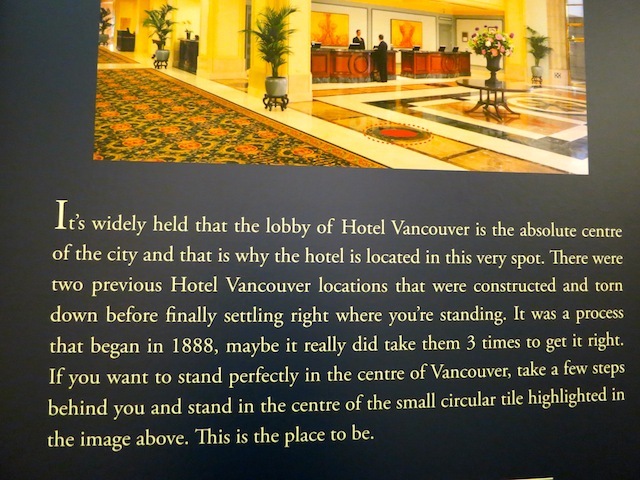 Let me sum up my Fairmont Hotel Vancouver blog review in five words: The hotel is a ‘she.’ And I can prove it. Let’s examine the facts. Not just any woman, the queen! The Hotel Vancouver was opened in 1939 by the Queen Mother, then Queen Elizabeth, wife of King George VI (and in the interest of not leaving anyone out, we should mention that her husband, the King, was there, too), when they stopped overnight in Vancouver on their grand rail trip of Canada. Now that’s a royal welcome! I’m staying at the Fairmont Hotel Vancouver at the start of my rail trip, the Passage to the West route from Vancouver to Banff on the luxury Rocky Mountaineer train. On the very year of the hotel’s 75th anniversary, too. Isn’t it just kismet? 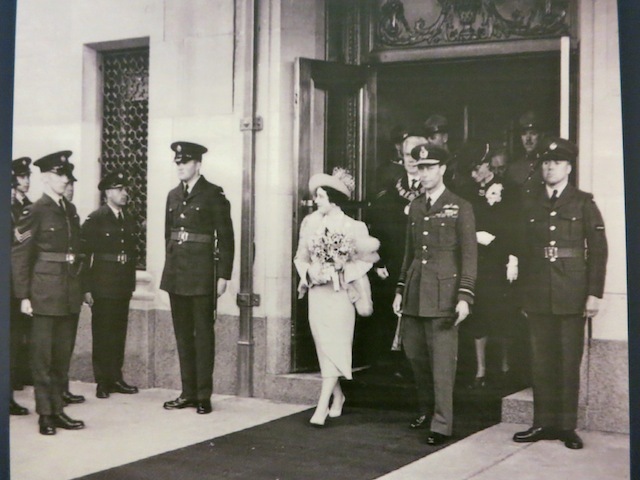 It must have been a relief to everyone in Vancouver when the pending royal visit in ’39 provided the motivation to finish the 557-room Hotel Vancouver, as it had languished half dressed for years, its skeletal steel frame exposed for all to see after the Great Depression halted construction. So let’s give a big cheer in memory of the always smiley Queen Mother, who finally got the hotel to finish powdering its nose, and helped transform it from a bag of ungainly bones to a French Chateau style railway hotel with striking copper roof and flamboyant gargoyle accessories. The famous Lady in Red, (not to be mixed up with the Chris De Burgh song The Lady in Red) is said to be the friendliest ghost alive, I mean, dead, I mean undead, oh, well, I give up. The ghost, Mrs. Jennie Pearl Cox, is an amiable sort of spirit, let’s leave it at that. Back in the early 1940s when Mrs Cox was still alive, she used to haunt (pardon the expression) the hotel’s swanky Panorama Roof Ballroom. At the time it was the hot spot for socialite crowd, awash with the sounds of Big Band music provided by the King of Swing himself, Dal Richards. Mrs. Cox enjoyed her parties at the Hotel Vancouver so much that after dying in a car crash near the Hotel Vancouver in 1944, she simply moved in with husband and child in tow. The Lady in Red is apparently partial to the 14th floor, though not adverse to milling about. She also likes elevator shafts (more about that later). But back to the Hotel Vancouver. It’s none other than our lovely Fairmont Hotel Vancouver that stands in for the Heathman Hotel in the 50 Shades of Grey film, and I’ve heard rumours of a steamy elevator scene. This brings me to the Hotel Vancouver’s elevator shafts. There are only six elevators in the hotel, but eight elevator shafts. Two planned elevators were turfed to save money. The Lady in Red is said to haunt the two empty shafts, and now I’m wondering if some steamy 50 Shades of Grey filming might have given her and her husband a few ideas (after all, she did like her parties and it’s not as if they don’t have the time), and if now the eternally happy yet transparent couple is recreating some ghostly elevator scenes … but that’s just my warped curiosity. Let’s carry on. 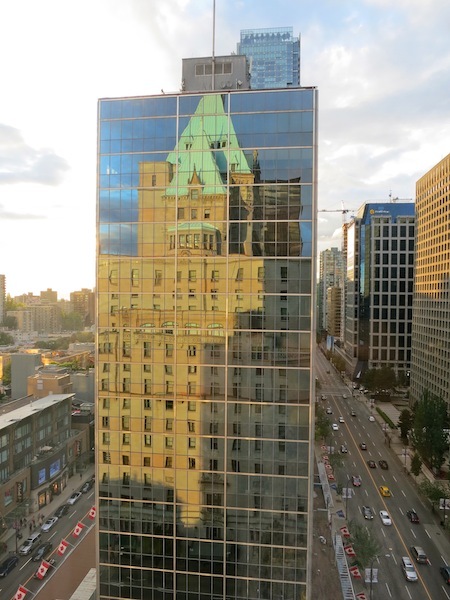 Yes, the Grand Dame of Vancouver is dolling up with a $12 million new lobby wardrobe, which coincidently, is exactly how much it cost to build the hotel back in the day. The unveiling will happen in November 2014 and I’m sorry I’ll miss it, so let me know how it looks if you get there before I do. 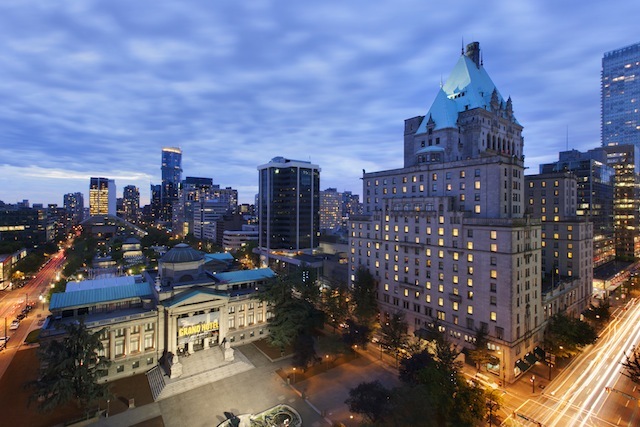 The gracious Fairmont Hotel Vancouver co-exists peacefully with two other Fairmont Hotels downtown, the more modern (but how can you love them as much?) Fairmont Waterfront Hotel and Fairmont Pacific Rim. Go to the lobby. 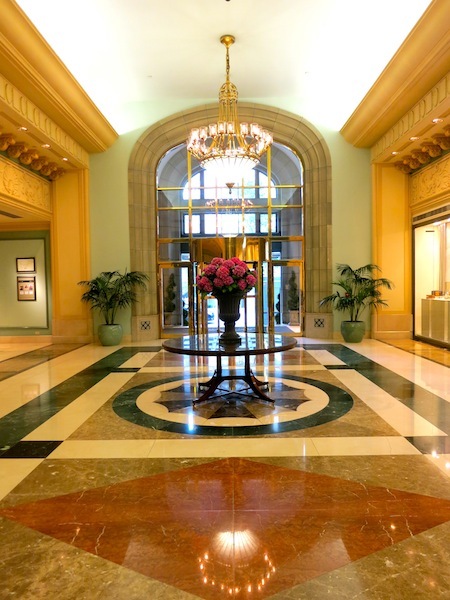 Stand in the circle in the floor (see red circle above) in front of the table with the flowers by the front desk. You are standing in the very centre of Vancouver! At least that’s what a sign on the renovation wall says. When I felt compelled to explain to the desk clerk why I was standing with my arms out in the lobby as if in some kind of trance, trying to commune with the very heart of the city, he didn’t seem to know what I was talking about. In fact, he was probably relieved when the crazy lady (me) finally left to go up to her room – and on her part, the crazy lady was just relieved he didn’t notice her patting down the walls in search of ghosts and secret elevator shafts. Because that would have just looked weird. What if I’m bored because I don’t see a ghost? Then you can walk the Fairmont’s two resident dogs Mavis and Beau. 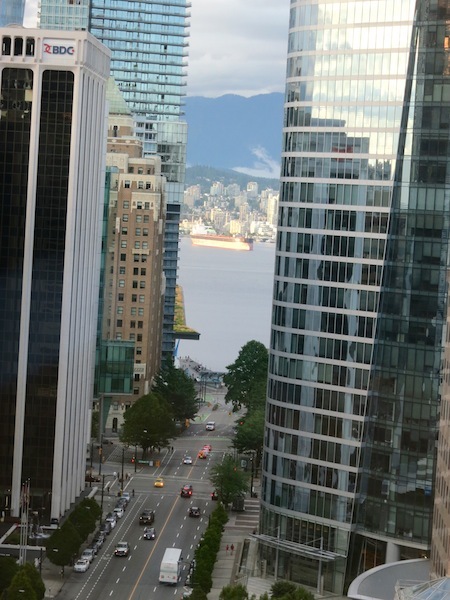 What’s near the Fairmont Hotel Vancouver? Plenty. Right across the street is the Vancouver Art Gallery, the largest gallery in Western Canada. Look out for the wonderful Emily Carr paintings – no one could evoke the spirit of the West Coast like Carr. Or just walk down Burrard to the waterfront. For loads more to do and see in Vancouver: see my One day in Vancouver blog post. Where can I drink a good cup of coffee? Very nearby is the bustling Bel Café at 801 West Georgia Street, the baby of celebrity chef David Hawksworth. Read more: There are plenty of other activities to experience in Canada. 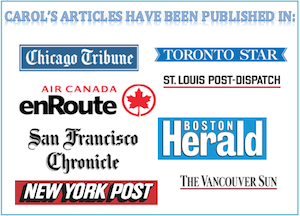 Get a start with my Things to do in Canada travel post. Read more: For more about travel to Canada visit my Things to do in Canada article. News to me about the Lady in Red. The best pedicure I’ve ever had was at this hotel. Always love the coffee from Caffe Artigiano in Vancouver too. This is great. When I stayed at this hotel, I was so tired I pretty much just fell into bed, had the best sleep, then showered and left. It’s really nice to read about the history and personality of the place. Nice. Congrats on publishing such a unique hotel review! Oh, let me know what you think when the reno’s are done, Megan! Love the history of Lady in Red, I had no idea! 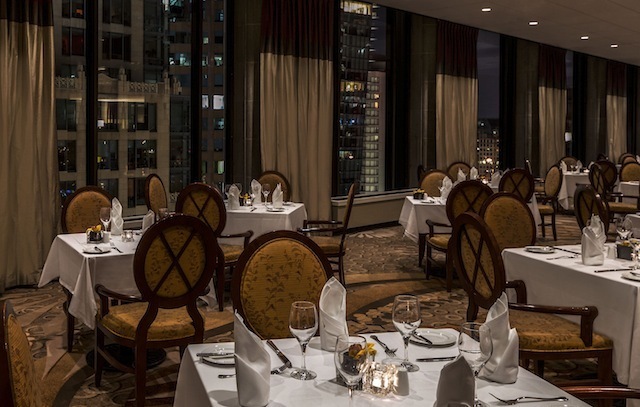 Living in Vancouver, I haven’t been to the Fairmont till recently. My aunt was staying here at the beginning and end of her trip and I went to visit her. It’s gorgeous in there and so much history! I wished she had room for me to stay as I would have loved to spend the night. 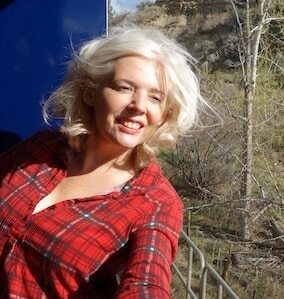 I believe a staycation is in order soon! Love the humorous and innovative way you approached this hotel review. Nicely done! If there was ever any doubt the Fairmont Hotel was the Grand Dame of Vancouver, there shouldn’t be any more. What a beauty.